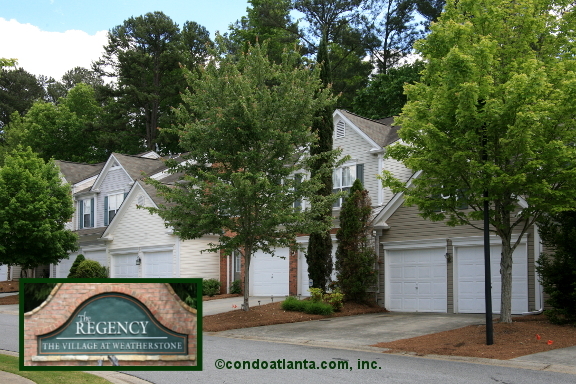 The Regency at Weatherstone is a community of traditional townhomes with garage parking. Enjoy all the benefits of a home in Woodstock near the shops, restaurants and entertainment venues of Town Center, and The Outlet Shoppes. Golfers will appreciate proximity to The Golf Club at Bradshaw Farm. Be sure to enjoy the lovely views, water sports, and recreation of Lake Allatoona. Commuters are convenient to the City of Roswell, and have ready access to travel routes along I-575, and Georgia 400. Community amenities include a swimming pool, and tennis courts for the enjoyment of Regency at Weatherstone homeowners.